Some people think that trampolines are only available to sit on top of the ground in their yard. This can cause people to worry about all the risk involved in owning a trampoline and when combined with the bulkiness of having one in their yard, may prevent them from enjoying one of the best ways to enjoy daily exercise. Now, there is a better way to enjoy jumping on a trampoline. An in ground trampoline is safer than traditional trampolines and according to many people, much nicer to look at in their yard. 1 What is an In Ground Trampoline? 2 Are In Ground Trampolines Safer? 5 Which In Ground Trampoline Type is Best for You? 8.1 How do you vent an in ground trampoline? 8.2 How much weight can an in ground trampoline hold? 8.3 How deep should an in ground trampoline be? 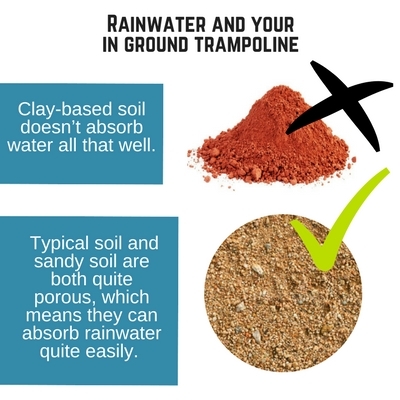 8.4 What happens to rainwater on an in ground trampoline? 8.5 How to drain an in ground trampoline? 8.6 Can I build an in ground trampoline on a slope? 8.7 How do I build a trampoline retaining wall? 8.8 How do you level a trampoline? 8.9 Is an above ground trampoline better than an in ground trampoline? 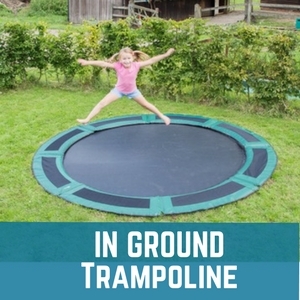 What is an In Ground Trampoline? An in ground trampoline is a trampoline that has the frame buried under the surface in a hole. 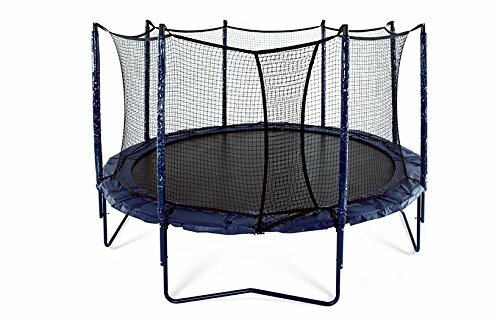 It has the same support as an above ground, traditional trampoline, but there is less risk of kids falling off of it while playing. It is also more appealing to see a sunken trampoline in the yard instead of having a metal frame that stands out. Some sunken trampolines are designed specifically for in ground use, that is, they come with the necessary parts/supports for in ground installation. They have heavier duty steel and some may have walls rather than legs for you to bury. These trampolines are significantly more expensive in some cases, depending on what type of trampoline you want. This has led to many people choosing the DIY underground trampolines instead, where you simply lower your trampoline into a pit. Are In Ground Trampolines Safer? A misconception we hear is that in ground trampolines are safer. If there’s no safety net the chances of a kid hurting him or herself is just as great as an above ground trampoline. If any child falls from 5 feet or more onto the hard ground there is a chance for injury. Also the hole where your trampoline sits in the ground needs to be bigger than your trampoline so it gets proper ventilation. This provides a gap where feet and hands could get caught in, which could lead to a severe injury. An underground trampoline will cost you a lot more money than an above ground trampoline. If you are really concerned with the atheistic looks of a trampoline in your backyard or live in a high wind area which could damage your trampoline maybe you should go the in ground route. There are some trampolines that come with the retaining wall which all are above $1000. For people going the DIY route you can buy the materials for a retaining wall which can cost as much as a trampoline depending on which one you buy. Then you have to factor in the time and costs to dig the hole. In the end a sunken trampoline will likely cost two to three times more than an above ground trampoline. Learning how to put a trampoline in the ground is not hard. Often, even the DIY type project is only a complicated process during the planning and digging stage. The rest of the assembly can mostly be completed within a couple hours. 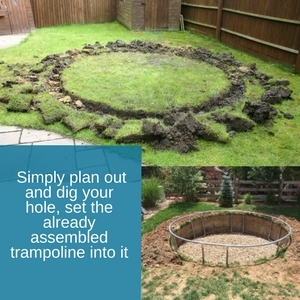 You simply plan out and dig your hole, set the already assembled trampoline into it, and put back some of the dirt to help support the trampoline. Please remember to dig a hole large enough so there’s a gap between the edge of the trampoline and the retaining wall. Without this gap the air will not be properly ventilated and the jumping surface will feel harder. This will lead to kids not being able to jump as high. Which In Ground Trampoline Type is Best for You? 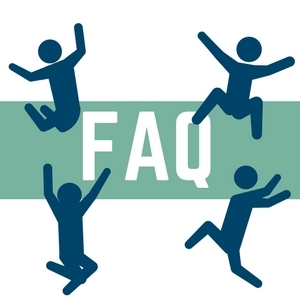 If you are considering the option to put a trampoline in the ground where it is safer and much less of an eyesore, you may be wondering about in ground trampoline cost. One of the best ways to explain the cost is to explore your options. Here are a few products that you may want to consider looking into. This in an American made pre-engineered in ground trampoline system. It comes in 12ft or 15ft round diameters which is a great size for kids and adults. This in ground trampoline design has taken into account critical aspects such as air flow, corrosion and water build up in the pit. The heavy duty galvanized steel frame makes this trampoline durable and long lasting. The padding uses a unique bungee cord system which is easy to put on and take off if need be. It also comes in three different colors (blue, green and grey) which gives you a few options. If you plan to install this in a grassy surface we recommend going with the green color. There’s also an upgrade version which comes with a stainless steel frame and springs. If you want an easy to install and great looking in ground trampoline this is the one! This is a trampoline that is designed to be put into the ground. It is made of galvanized, powder coated steel frames, and stainless steel hardware. It has 120 galvanized springs that are 8.5”, which is larger than some traditional trampoline springs. The jump surface is made of heavy duty polypropylene and it will resist UV rays for long term durability. The spring pad cover is extra wide and available in either blue or green. Total, the trampoline will weigh about 330 pounds and you will need a couple people to help you sink the assembled trampoline into the pit. 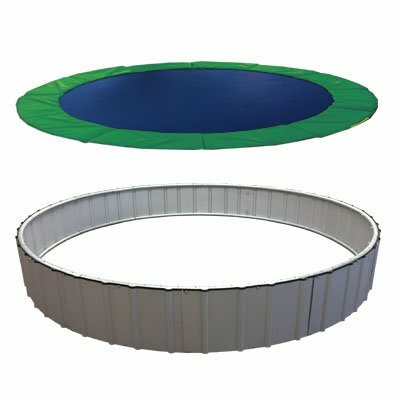 Whether you want to use the enclosure on your ground level trampoline or not, you may enjoy having that option. This trampoline is 15ft in diameter and has reinforced T-sockets to stabilize the enclosure to the trampoline frame. The entire frame is made of heavy gauge galvanized steel that will resist rust and has six W shaped legs. This trampoline has a 15 year frame warranty and it is easy to put together. The diameter of the trampoline is made of 14 gauge steel that is 1.75 inches in diameter. It is taller than most other trampolines. There are 96 8.5 inch springs and the mat is made with permatron. How do you vent an in ground trampoline? Knowing how to vent an in ground trampoline is incredibly important, especially when it comes to the safety of those who will be using it. Digging into the ground is, obviously, the way you vent your in ground trampoline. To start, you must know how big the trampoline you are getting is. Once you know, ensure that you create a hole that is a foot wider than the trampoline’s outer frame. If you are using a retaining wall, you will need to incorporate the space for it on top of this, however. Alternatively, a lot of people leave a gap in the hole and add some safety netting. This is a great way to keep everybody using it inside of the trampoline while also ensuring that no one trips over it. You also won’t have to worry about legs falling in between, too! Ensuring that you have the right measurements and make the proper hole is necessary for helping to maintain the best possible bounce while having enough air ventilation. How much weight can an in ground trampoline hold? Pit trampolines, more commonly known as in ground trampolines, can hold varied amounts of weight. The manufacturer will always tell you how much weight a trampoline can hold, so this will depend on the trampoline you’re purchasing. How deep should an in ground trampoline be? A low to ground trampoline and how deep in ground trampoline should be will depend on a number of general positions. For example, take the height of your trampoline and make sure you dig deep enough so that’s it’s equal. The trampoline needs to be flush with the hole you dig, but this may cause a ventilation problem depending on the trampoline you have. 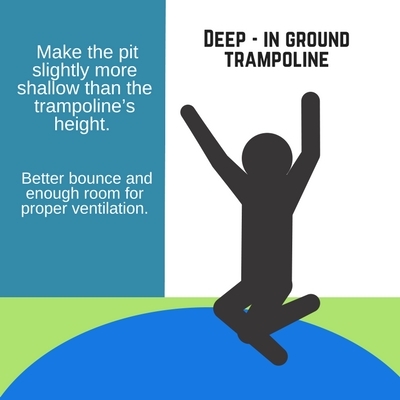 If this is the case, make the pit slightly more shallow than the trampoline’s height. Doing so will ensure that you have both a better bounce and enough room for proper ventilation. What happens to rainwater on an in ground trampoline? There are many things that can occur when it comes to rainwater and your in ground trampoline. For starters, if you built your trampoline into a clay-based hole, rainwater can cause some serious problems. If you only have clay-based soil in your backyard and not dirt, we suggest investing in an above ground trampoline. Unfortunately, clay-based soil doesn’t absorb water all that well. What’s worse, it can actually cause a sealed barrier, trapping the water in the hole and possibly flooding the trampoline. Your typical soil and sandy soil are both quite porous, which means they can absorb rainwater quite easily. Even if there’s a small puddle in the center, it won’t be there for long. If you’re living in an area that has a high water table, you may also be in trouble. Living in a high water table area means that sometimes the water will come up and out of the ground into the trampoline hole, flooding the trampoline. Whatever your case may be, you should always be prepared for drainage problems. How to drain an in ground trampoline? Draining an in ground trampoline can be a headache, but there are some things you can do to prevent your trampoline from being flooded, and a lot of other ways to ensure that draining it goes smoothly. 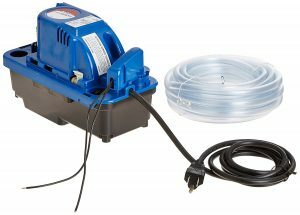 An electric drainage pump will always save the day quickly and efficiently. We highly recommend the VCMX Automatic Condensate Removal Pump by Little Giant. It’s fast, portable, and only costs $50! You can also install a 4” drainage pipe within a lower area of your backyard or your garden, but this is more easily done while you are installing the in ground trampoline. You’ll need to dig a trench that leads to a lower area, further laying the drainage pipe. For this to properly work, water must be able to freely come through the pipe and go down a slope elsewhere. Whatever you do, always make sure you have a plan for drainage in place. Standing water will cause the trampoline to rust, for one. Can I build an in ground trampoline on a slope? Building a DIY trampoline underground on a slope will work, yes. In fact, a lot of gardens and backyards don’t have fully leveled ground, so you should expect to have to build it on a slope. To learn more on building a trampoline on a slope, and for some tips on how to level the ground, scroll down! How do I build a trampoline retaining wall? A trampoline retaining wall is going to require some serious work, but it’s definitely worth it. A retaining wall is very important where your safety is concerned. For the best possible results, make sure you’re using concrete or stone blocks. They are the best way to ensure dirt doesn’t collapse into the pit or onto the trampoline itself. You can also use a combination of wood and dirt to create a retaining wall, as well. 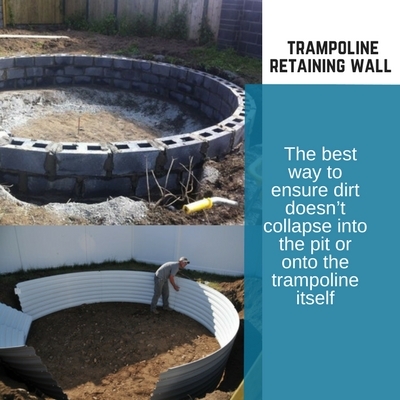 Overall, you can build a retaining wall by creating a barrier between the edge of the trampoline and the dirt hole. Think of how an in ground swimming pool looks, but with a trampoline installed instead of being filled with water. You can also purchase an in ground trampoline retaining wall, either together or separate with an in ground trampoline kit, such as the Stainless Steel Upgrade by In Ground Trampolines! How do you level a trampoline? If the slope is a small one, just dig a touch further on the higher side to keep it leveled. You can also let your trampoline slope a bit, but make sure it’s not lop-sided. Building up on the soil will also work, so feel free to try out a few things. However, is the slope is a steep one, it’s going to take some more work on your end. You will need to dig out an area and make it as flat as possible. If the edge of the trampoline is meeting the edge of the slope, you’re going to have a serious problem when you jump on it. 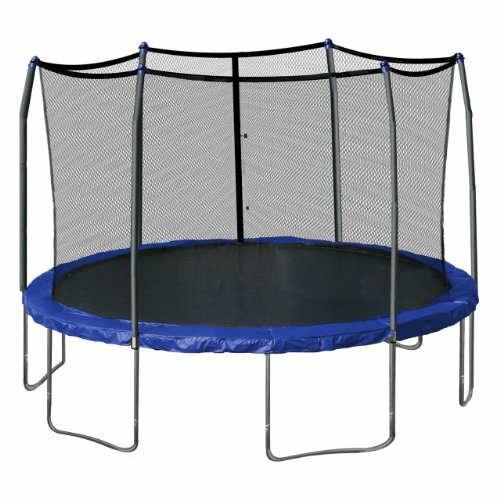 Is an above ground trampoline better than an in ground trampoline? It depends what exactly you’re looking for. We cover this question in much more detail in our article here. Having an in ground trampoline in your backyard doesn’t mean you can’t have fun with new landscape ideas! For example, you could install it in a patio area. While this may take extra work, it ensures that your lawn won’t take a beating. Creating a trampoline area to the side and installing gravel in that area, but with trampoline safety netting, gives kids a fun spot of their own. If you have a swimming pool, why not install it a safe distance from it? Just remember to educate everyone about the dangers of abusing the trampoline so close to the swimming pool. If possible, you could even connect the two using a retaining wall if you use concrete. 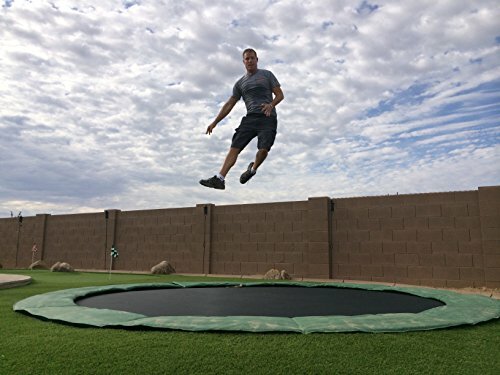 There are so many fun things you can do with an in ground trampoline in your backyard, but these are just a few prime examples to fuel your imagination and see where it takes you!